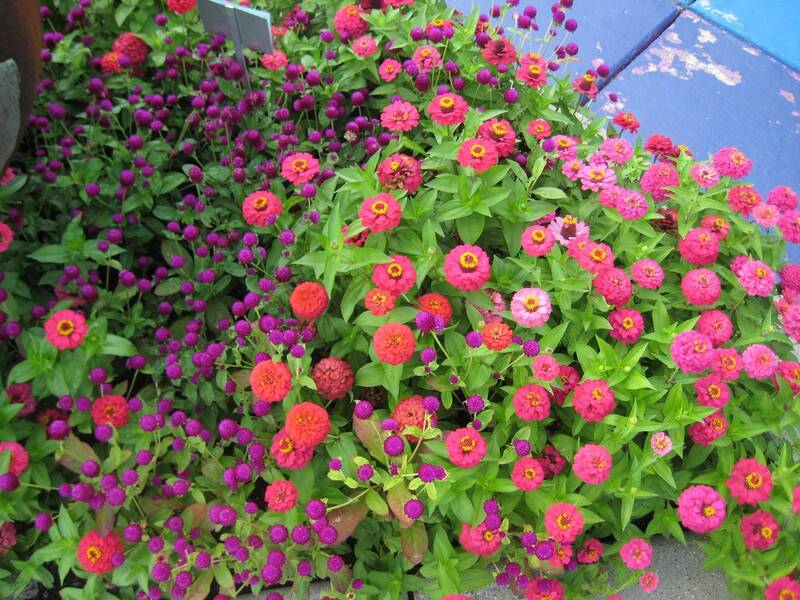 This article covers the basics on using color in your garden bed. When you get right down to it gardens are really about color. That color can come from flowers, foliage, bark, pottery, furniture, fences and even artwork, but in the end it is all about color. 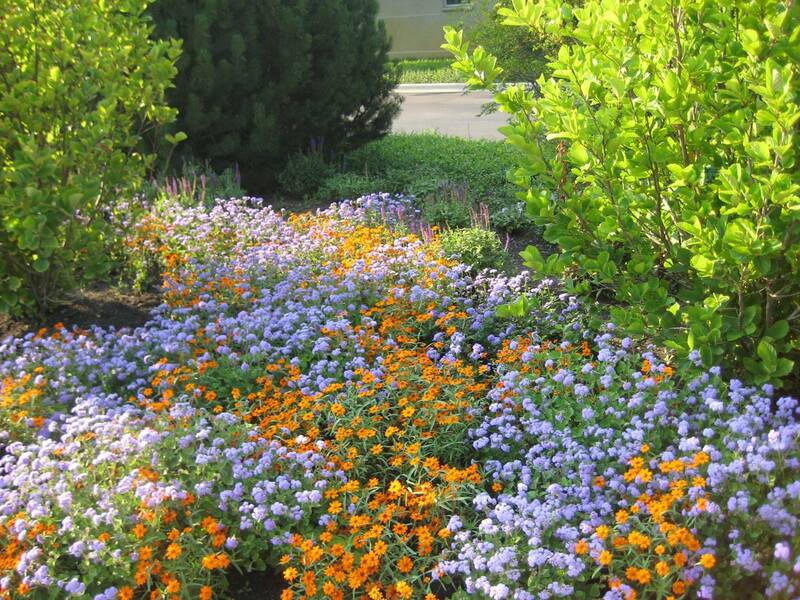 Our gardens are meant to enhance our lives and to make our homes look better from the curb. Color can be soothing or exciting, it can be a riot or a river, it can be front and center or something much more subtle, but whatever our choices, color is the goal. 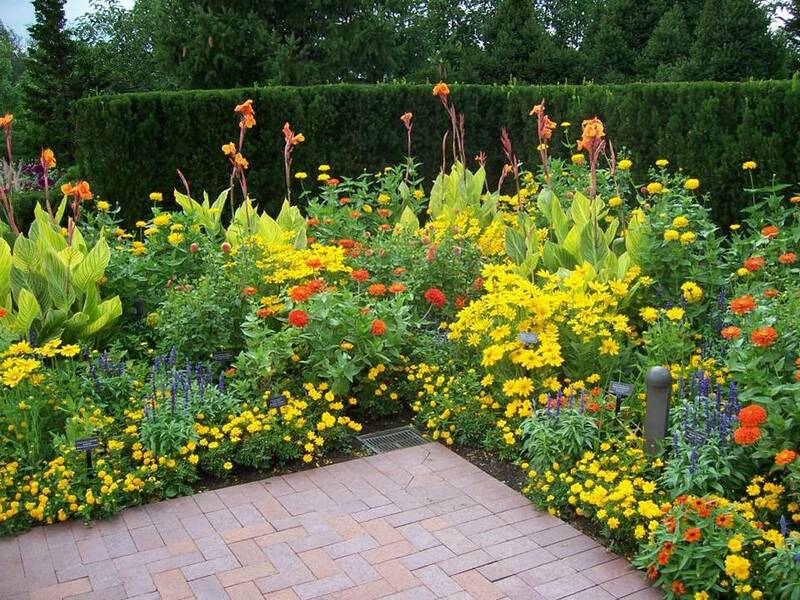 Any color scheme can work, it's your garden so if you're happy who cares what anyone else thinks. However, understanding the basic principles of using color in design can help make that picture in your head a reality. Be it a soothing sanctuary or a patio ready for a party. 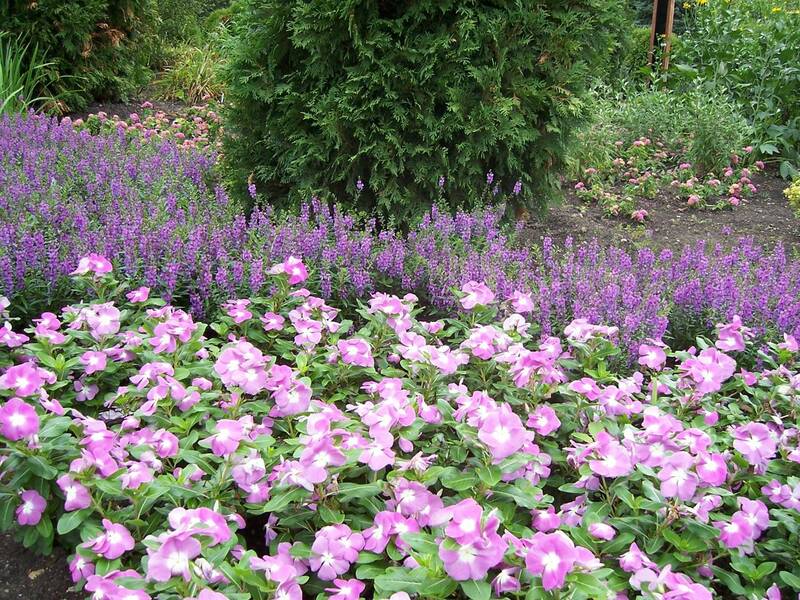 The first thing to learn is which colors are considered neutral in gardening. Neutral colors are those colors that can be used with any other color without changing the effect that you are trying to achieve. White, black, grey, silver and shades of brown are considered neutral in any arena. 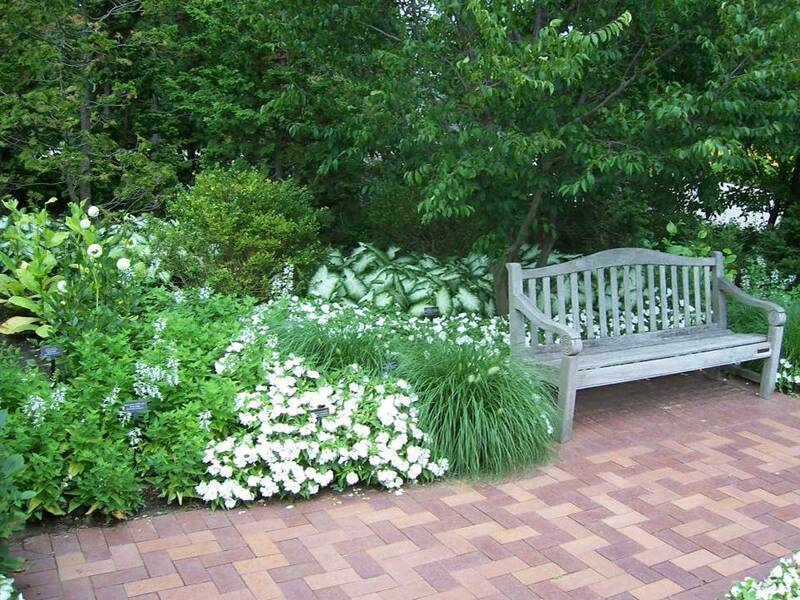 In gardening, green also functions as a neutral. 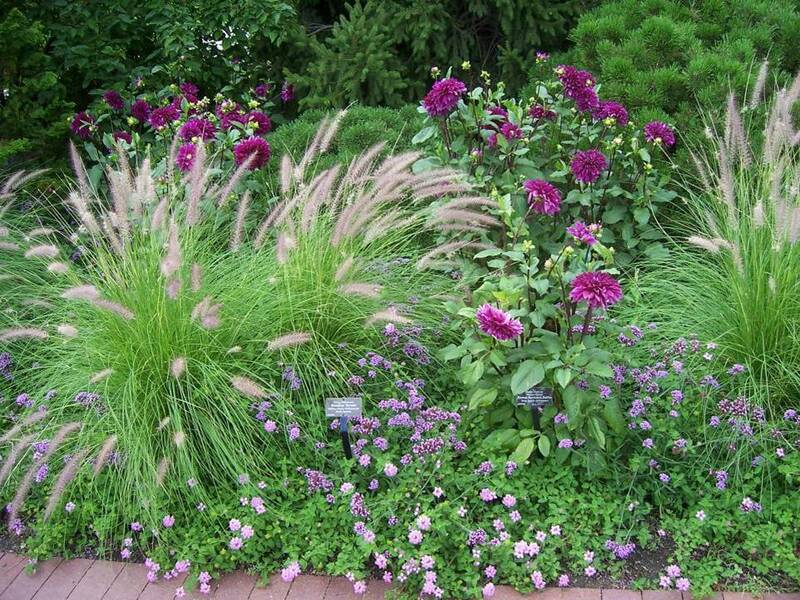 Neutral colors will have a tendency to tone down the other colors in a bed and can be used as a buffer between two plants that might otherwise clash. While white funtions as a neutral in the garden, it also serves another purpose. 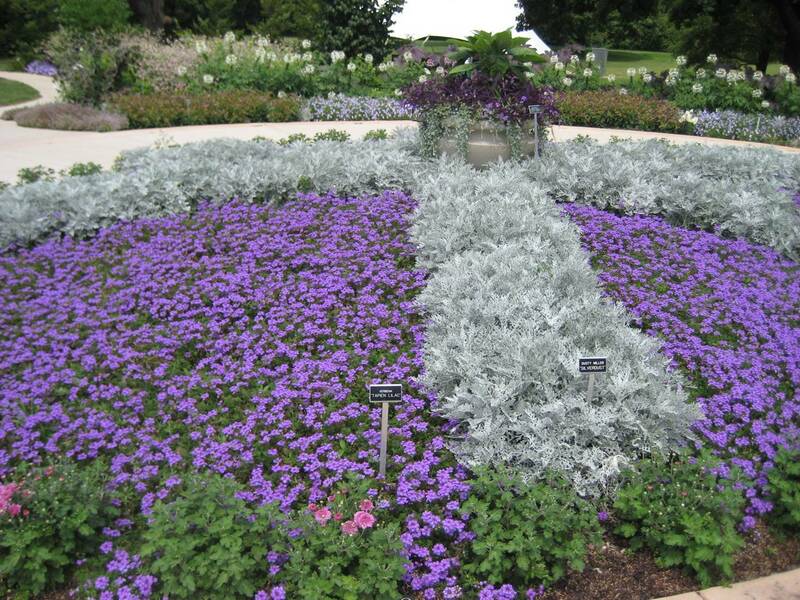 White glows when you view the garden early in the morning, during the evening and at night. With busy lives, many of us view our gardens less during the day and more often during twilight hours. If you will be using your garden often after dark be sure to include a healthy dose of white flowers and silver foliage. These plants will show well in the evening. The easiest color plan to pull off is probably the monochromatic color scheme. 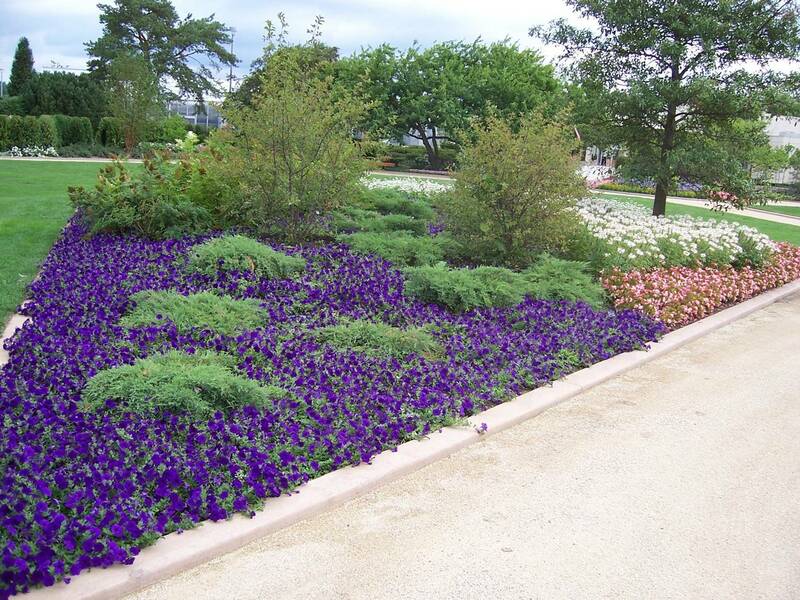 Which is simply combining shades of a single color together to create a garden bed. 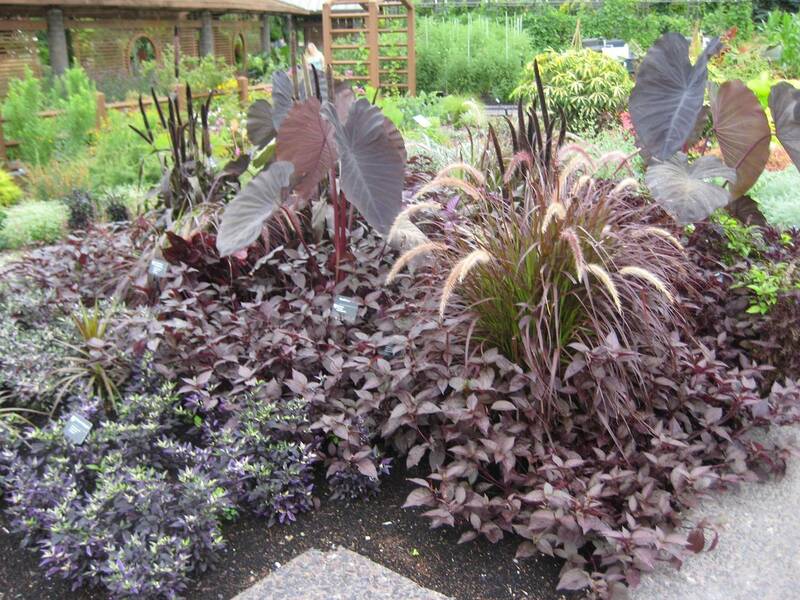 These beds are simple to put together because choosing plants from a single color family is pretty easy to do. I know monochromatic can sound boring, but these beds don't have to be blah. They can include great depth and interest as illustrated in the photos below. Now comes the part that can be a little bit more intimidating, mixing different colors together. Mixing colors doesn't have to be difficult and learning to successfully mix colors is easiest if you use the color wheel as a starting point. 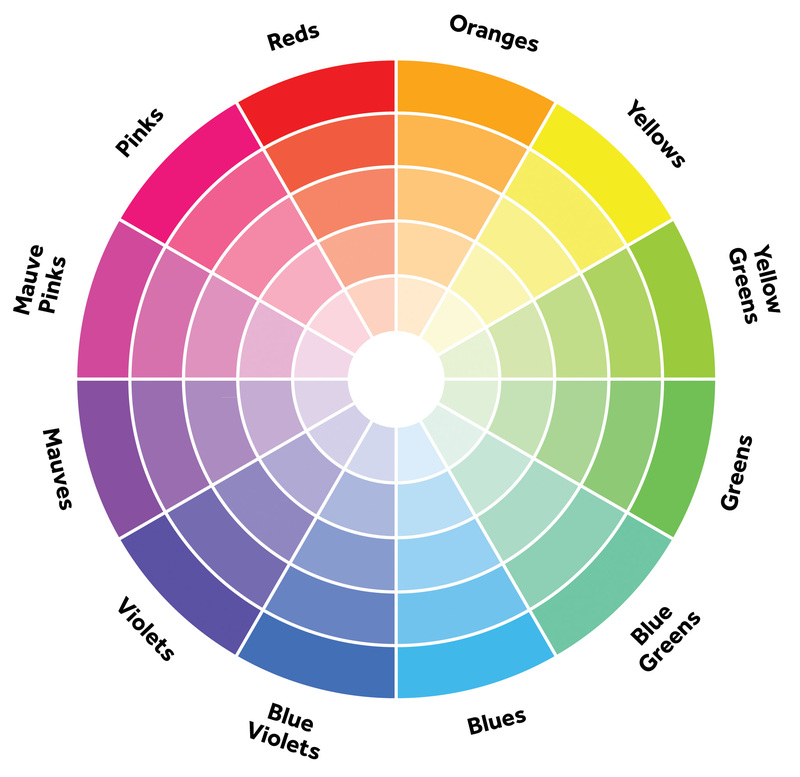 I know just hearing that you might be using a color wheel may strike terror in your heart, but take a deep breath and repeat after me "The Color Wheel Is My Friend." Really. The first key to understanding mixing colors is to look at the basic relationships between the colors. Using the color wheel is the easiest way to illustrate these concepts. One easy way to combine colors is to use analogous colors. 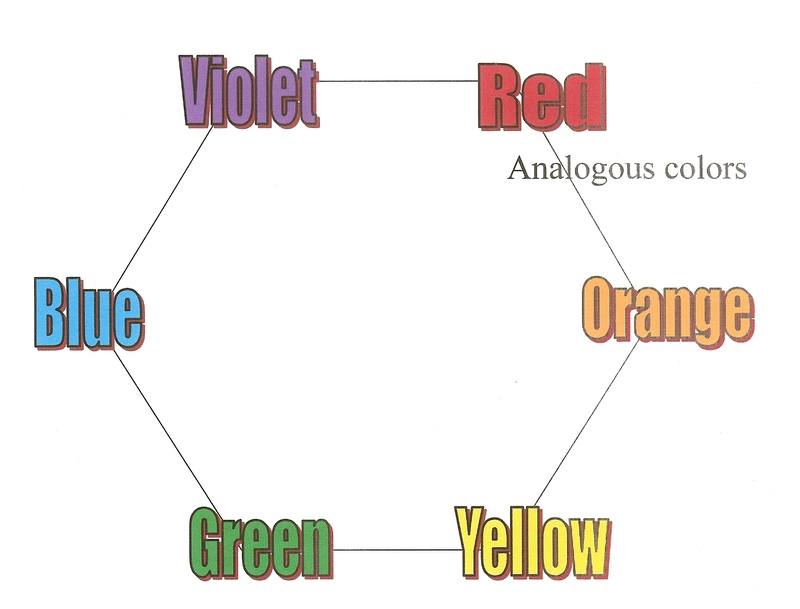 Analogous colors are those that are next to each other on the color wheel. These colors tend to blend together well. 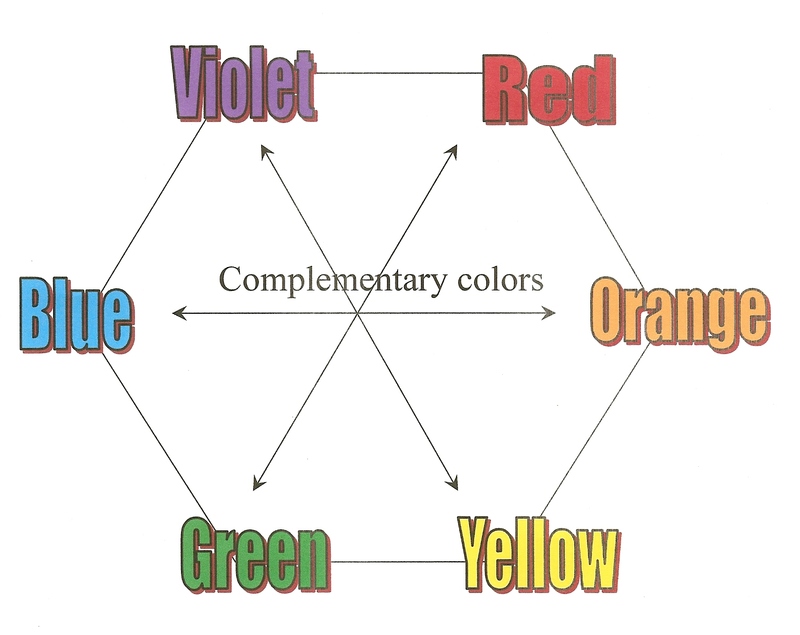 The diagram below shows the 6 major colors on the color wheel. Analogous colors include red and orange, orange and yellow, yellow and green, green and blue, blue and violet, and violet and red. Analogous colors can go beyond two colors, groups of red, orange, and yellow or blue, violet and red can also be considered analogous colors. Here are some photos that illustrate use of analogous colors in the landscape. From left to right: violet and red, red and orange, orange and yellow, and green and blue. If you are a bit more adventurous and like some contrast in your colors, try using complimentary colors, which can add a lot of pop to your bed. Complimentary colors are opposite each other on the color wheel. The diagram below shows the different complimentary colors. The 3 complimentary color pairs shown here are violet and yellow, red and green, and orange and blue. Here are some photos that illustrate the use of complimentary colors in the landscape. From left to right are orange and blue, violet and bright yellow, and violet and light yellow. The third color scheme illustrated by the color wheel is the color triad. The color triad is created by drawing an equilateral triangle connecting 3 colors in the color wheel, see the chart below. 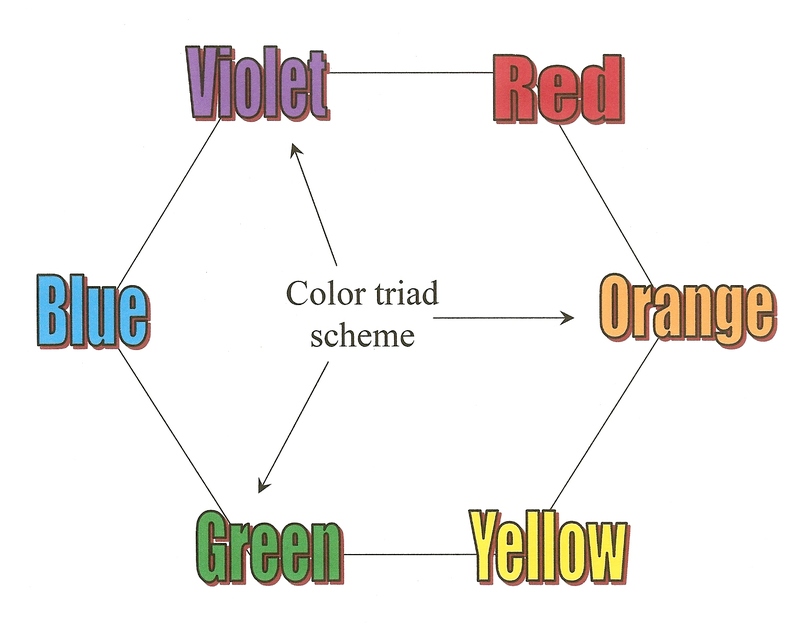 In our illustration red, yellow and blue are a triad and violet, orange, and green are a triad. For a real life example of each triad, look at the photos below. The photo on the left illustrates the red, yellow and blue triad while the photo on the right illustrates the violet, orange, and green triad. Colors also fall into two different categories, dark and bright colors. Dark colors, like blue, purple and pink, tend to create a calming and serene atmosphere and will appear cool in even the worst heat. Dark tones are perfect for creating a sanctuary, where you can go to unwind and de-stress from the chaos of life. These colors are great for setting the mood for gatherings filled with soft music and quiet conversation. I have always tended to be attracted to bright colors, but I was a bit timid in how I mixed those colors together. I tended (still do to some extent) to be most comfortable combining analogous or monochromatic colors. Then several years ago, I had a bit of a color epiphany, brought on by a giant corally-pink wall that we installed in a garden we use for a trade show. While I love the color, we used a paint color match system to duplicate the color of my winter coat. I wasn't so sure a 15 foot tall, 100 foot long, wall painted that color was the best idea. However, after painting the wall and placing almost every color imaginable, including salmon, in front of it I realized that you should never be afraid of bright colors. A wider range of colors than you might think will work together, a fact I have to keep telling myself. A huge, bright coral-pink wall might be a bit of overkill, although pretty fantastic; bright pink chairs might just fit the bill. If you are afraid that you might get tired of the color, don't worry. A simple coat of paint changes everything. By now the wall has been at least 5 different colors and the chairs have to be on at least their 10th coat of paint. A coat of paint changes everything, from a bright pink party to a soothing blue sanctuary in a few simple brush strokes. OK, make that a few gallons of paint. One last point, the most important thing is that you love your garden. 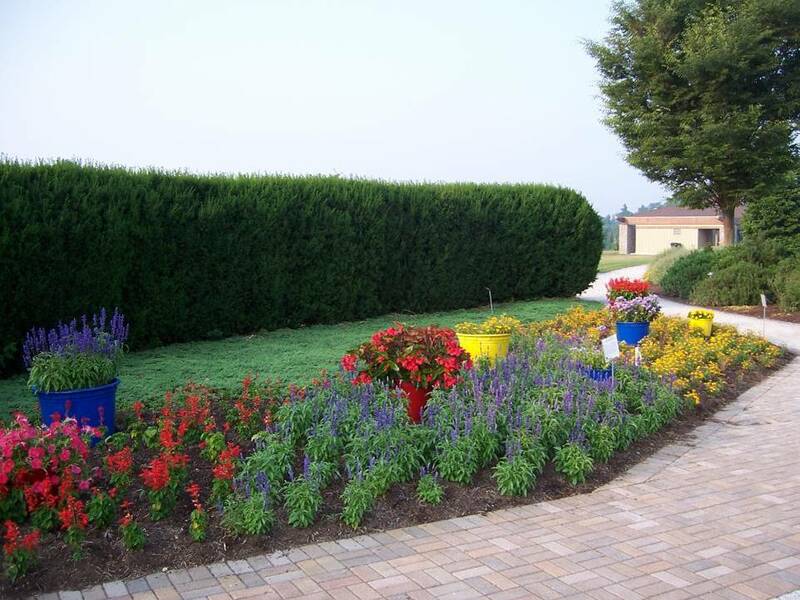 If you have to leave these color principles behind to create your dream garden, do it. If you're happy, other opinions do not matter. To learn more about basic principles of design click this link. Hi, thank you for this article. I can't see the photos. Please, can you find a solution? This sounds like it might be a browser issue. Maybe try using a different browser or it could be the browser you are using needs to be upgraded to a newer version. I hope this helps! Your color wheel is off it need orange-yellow so that red is opposing green and blues opposing orange etc. There are certainly more complicated and detailed color wheels than the very simple one I featured. Google or another search engine can direct you to more detailed versions. Thank you. I'm glad you found it helpful. 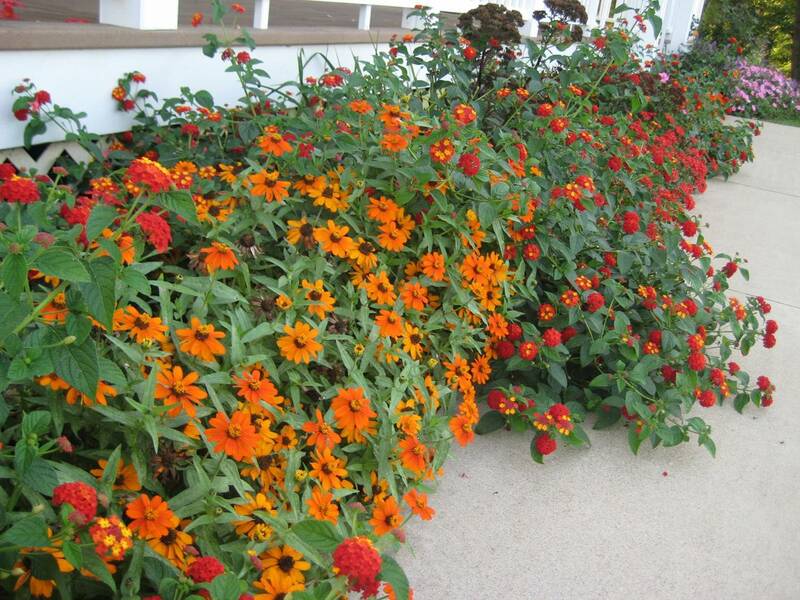 I tend to use marigolds ( mostly mixed and African orange ) as they are carefree and have showy colors. However , i do love my pinks - and use them in geraniums. I have 2 flower beds in my yard - one an island along the curved walk, the other is straight in front of the house and ends in a small slightly curved "L" The beds get morning sun for about 6 hr. How can i use the marigolds and pink/fusia geraniums and create a cohesive look ? I was thinking of incorporating Gaura along the front. Many Thanks for any comments. I think yellow geraniums and pink geraniums would look great together. 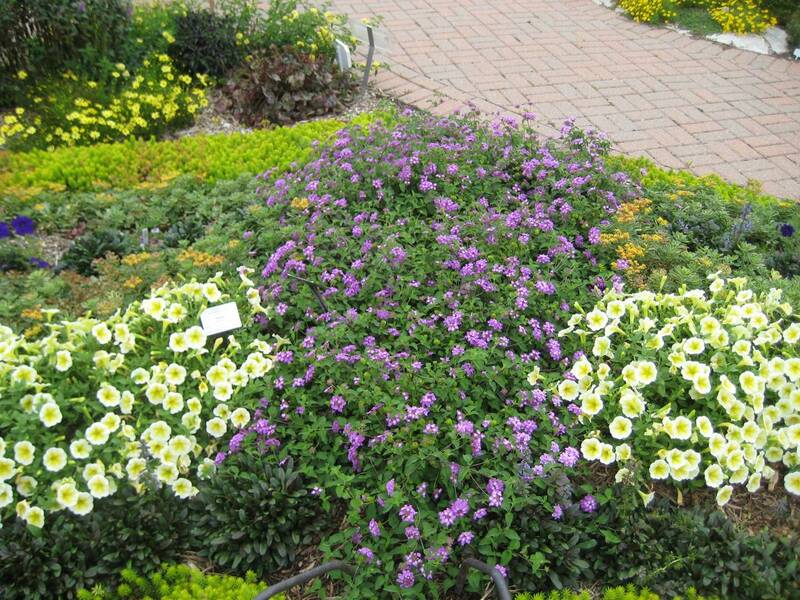 They are both durable plants and should take little care other than deadheading and a bit of water to keep them happy. Red/yellow/blueish combination for year round color? I have a small/medium garden area by the road that is a mess. We just moved into this house in May and am finally starting to put thoughts together on what to do with it. We are zone 6a. On the outermost edge, some sort of red. Probably spread out some. Behind that, the yellow, which I'm thinking Sunshine Ligustrum, maybe eventually turning it into a hedge. Behind that, Dwarf Globe Blue Spruce. For the red, I was exited about Crimson Fire Loropetalum, however it's zone 7-10 so that's probably out of the question. Are there any other reds that would work in zone 6 that would keep it's color and foliage all year? If I can't find an evergreen type and have to go deciduous something like Pygmy Ruby Barberry looks appealing. Anyone have any thoughts on any of this? Thank you for any feedback. 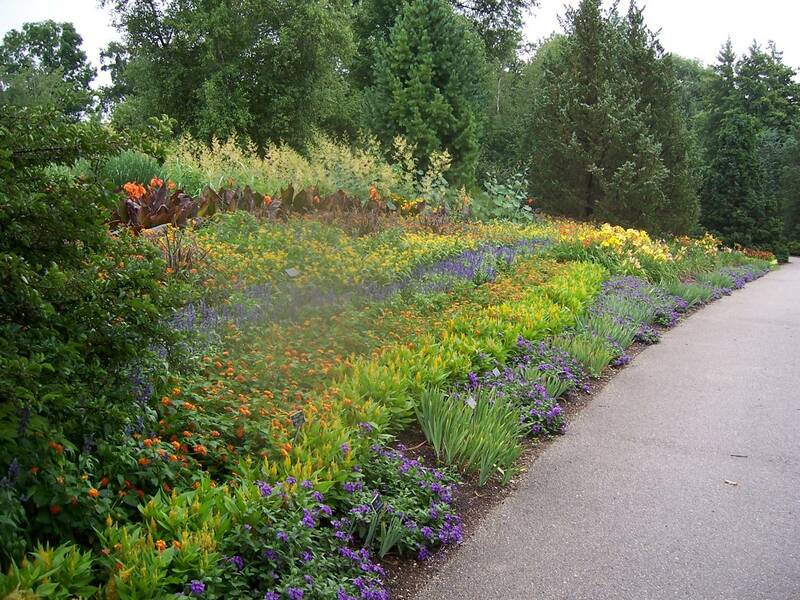 I am having trouble conveying what types of colors I like for the mood I want to create to our landscaper. He keeps bringing red and I don't want it for the whole thing! I am not a huge purple fan, but this helped me realize how it does soften an area. We have 2 large connecting ponds, and I want a relaxing feel for it. Your article helps me understand more about color choice. Thank you. If our home is lime green and beach sand and soft blues how should that relate to the garden please ? This is going to sound odd, but you can really treat the lime green color of your house as a neutral. One of the things that I've learned from trade shows is whatever you put iin front of lime green will pop! Lime green is an instant contrast factory. You can go almost any way you want. use soft yellows and blues and you have a soothing contrast to your home. Try bright pink, red and orange and you have a fiesta. 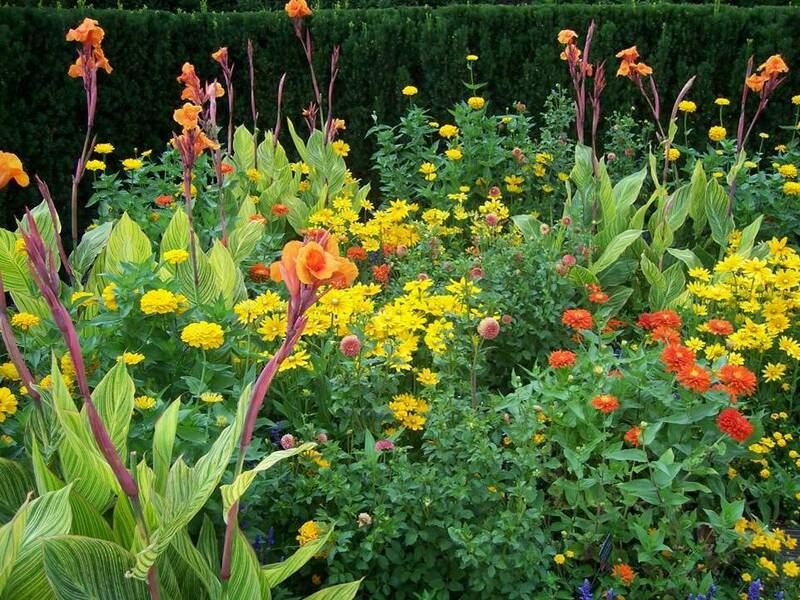 Basically decide the mood you would like each part of your garden to have and then choose the colors that accomplish that. So if you want to create an invigorating place to socialize, choose bright colors. If you want to create a soothing place to relax, go for soft colors. Truly, pretty much anything you choose should work fine with the color of your home. Beautiful examples of color combining - gotta love the tried and true color wheel! 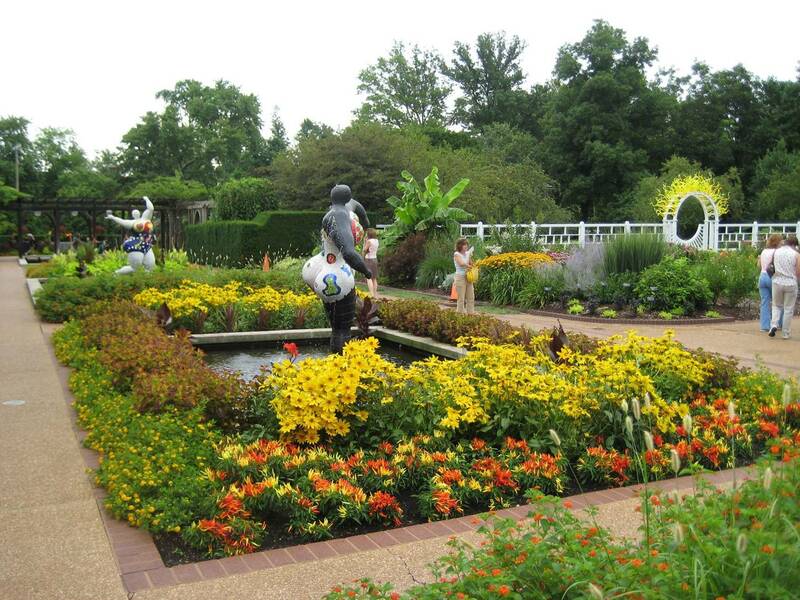 Oh how I would love to have the same go to guide in selecting complementary plant/flower shapes for the garden. I need a shape/texture/density wheel! Now I'm wishing I had the creativity and photo shop abilities to try and create a shape/texture/density wheel. Hmm, I'll have to think about how to put together helpful information on how different shapes and textures work together. 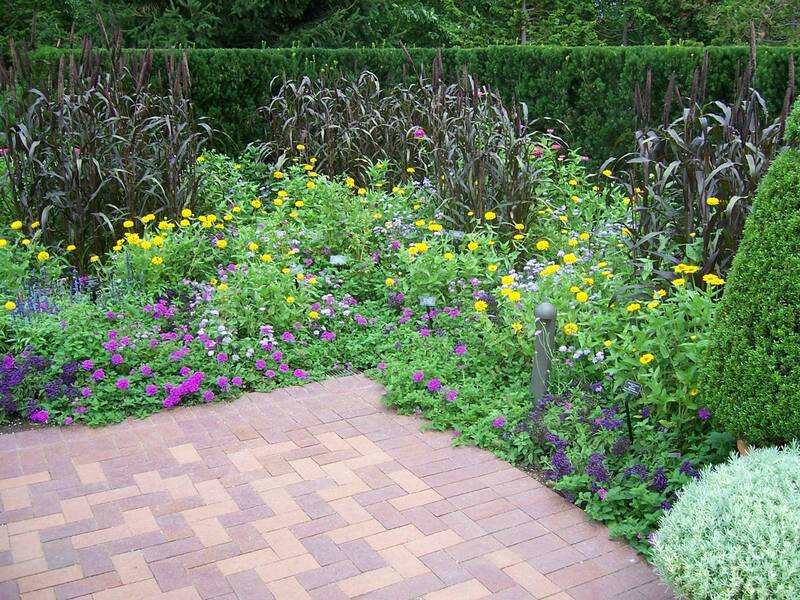 I'm not sure about a color wheel treatment but a series of articles on how to create different feels in the garden like cottage garden or a bold texture garden is probably doable. I wil certainly keep that in mind for future article ideas! What colours would you pair together in winter containers? Hope this helps to inspire you! Good article but pictures are way to small to appreciate. Thank you for your input, if you'd like to take another look, we've increased the picture sizes. Hope that helped! I always can count on your plants to perform well in my garden. I enjoy looking for new colours & ideas on your site. This gardening sitoe is the best !